1. Boil the milk and add sugar. Beat the eggs until soft and fluffy. 2. Cut the bread into fine pieces. Add the bread pieces to the milk an add beaten egg,lemon rind, vanilla essence and raisins. 3. Mix well. Grease the baking tray and pour the mixture into the tray. 4. Keep the baking tray in the pre-heated oven. Bake at 200 degrees C. for 30 minutes. 5. Serve hot. 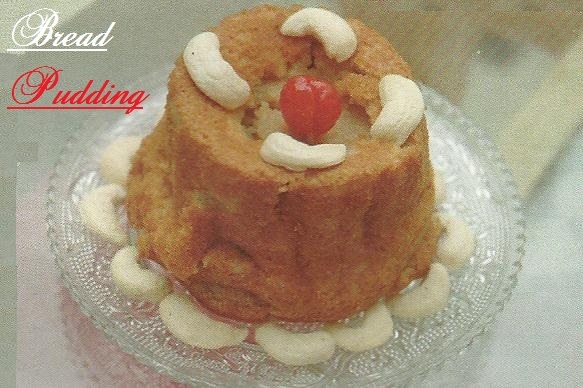 Top the pudding with a cherry and decorate with nuts. Njoy!! Love this yummy bread pudding. Perfectly baked Rita. All times favorite. Delicious Bread pudding Rita, I love it. it looks truly delicious...guess lemon rind adds some extra flavor.. Thank you Rani & Divya! !